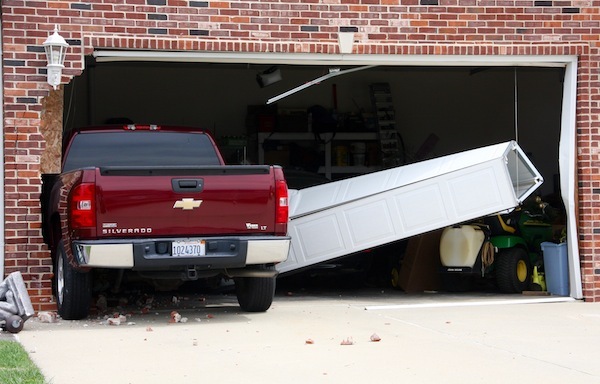 Columbia police, fire and EMS responded about 1:30 p.m. Thursday to the report of a pickup truck that struck the garage portion of a residence at 1516 Clover Ridge. There were no reports of injuries at the scene. Police said that Carlyle Wilde, 72, of Columbia, drove his 2009 Chevrolet Silverado into the driveway of the house, wanting to turn around. His foot slipped off the brake pedal and onto the accelerator, causing him to crash through the closed garage door, the door structure, landscaping in front and into a 2011 BMW parked inside the garage. Wilde was cited for traveling too fast for conditions.